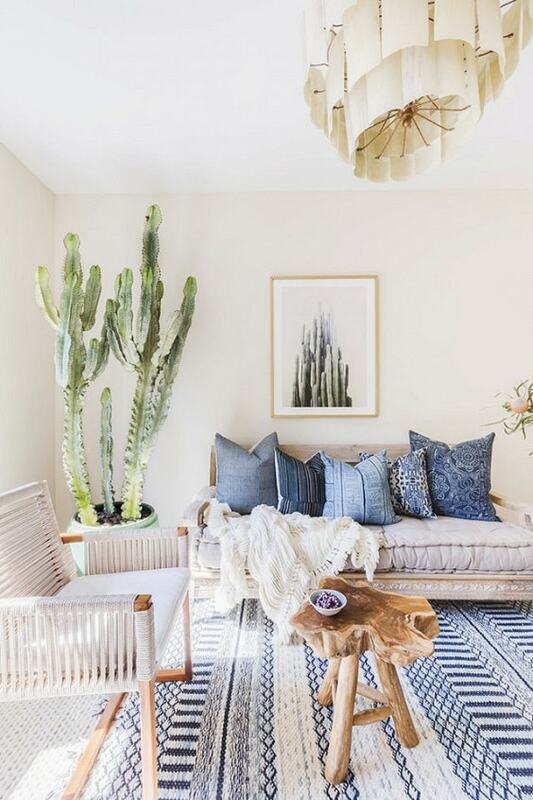 It’s so undebatable that the Boho style never loses its throne to give a room’s decoration a superbly chic touch. 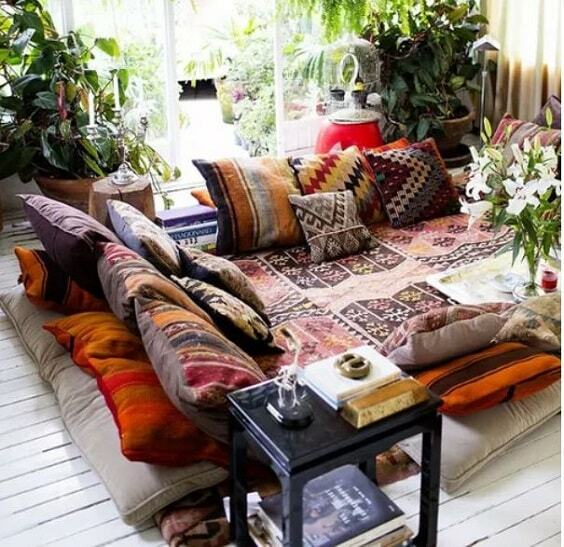 From time to time, lots of homeowners choose to go with the Bohemian layout to make their home look and feel as inviting as possible. The Boho decoration is always everyone’s favorite up until today since it still brings such a timelessly beautiful look. You can still call it a trendy layout though it has been invented from a long time ago. 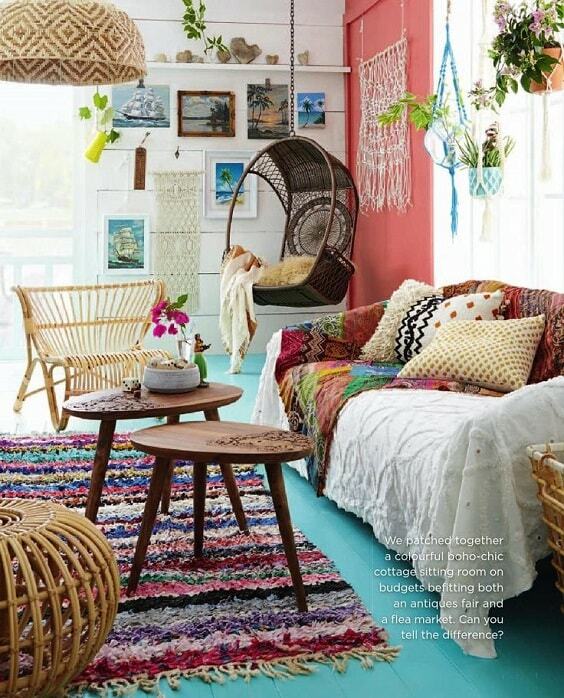 The festive decor, colorful layout, and warm nuance are some essential characteristics of the Boho-themed room. 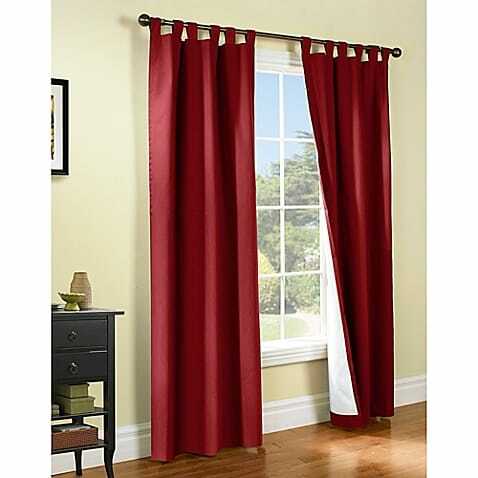 It will give your house a unique atmosphere with its particular look. 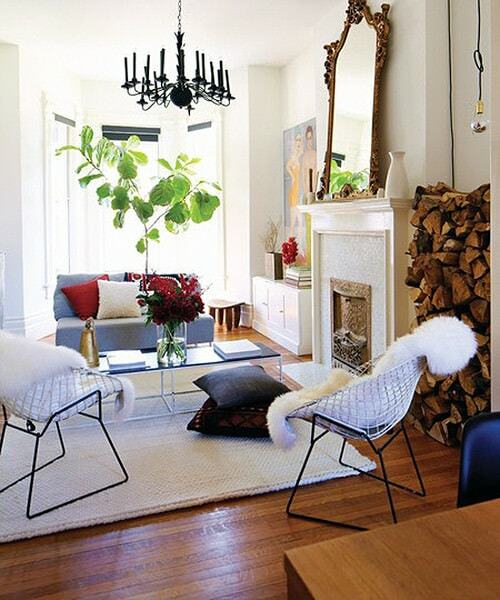 If you want to bring the Boho style to your beloved home, the living room is totally the considerable one to choose. It’s the room where everyone gathers around and do lots of activities, so it’s always an important thing to keep it enjoyable all the time. Here, we have dozens of inspiring Boho living room decoration ideas which looks so tempting to copy. You can apply these inspirations to your very own living room without costing you a lot. 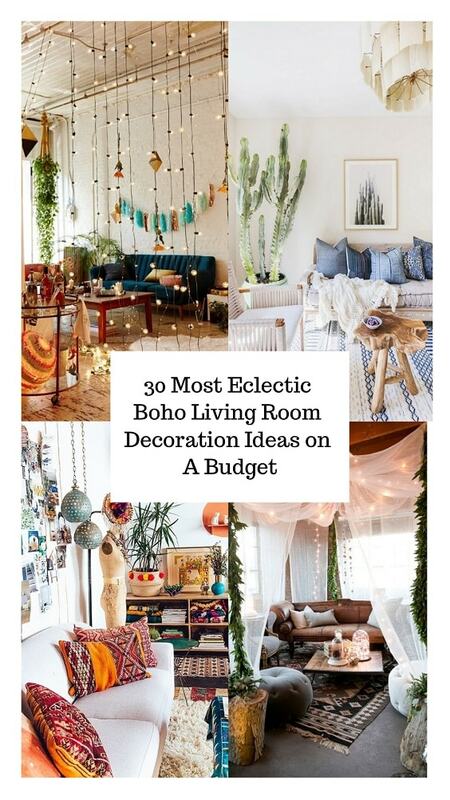 Well, let’s just keep scrolling to check our pick of Boho living room decoration ideas! This one is basically a black and white room which is decorated with some earthy-nuanced furniture and indoor plants. Those elements are enough to give the room a nice Boho touch. 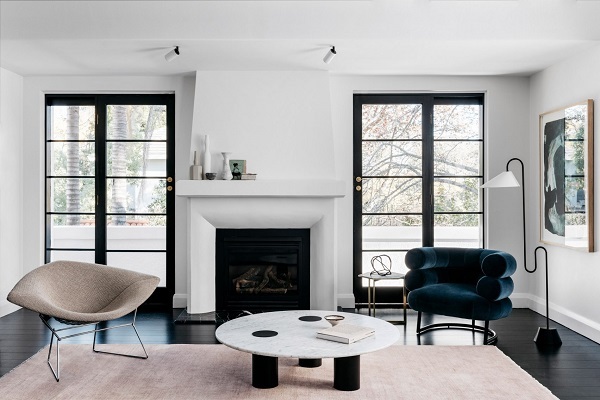 To add a more decorative vibe, a geometric black and white large rug completes the room perfectly. 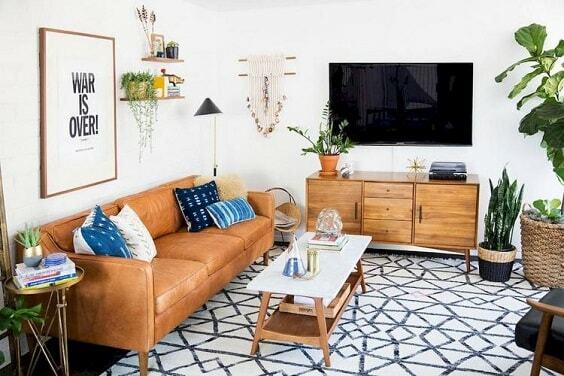 For you who have a small narrow living room, this Boho living room decoration can be a good inspiration. The houseplants are scattered around the room which creates such a cozy nuance beautifully. The key to keeping the room look fresh is it’s surrounded by the huge glass window which creates a wider impression so it doesn’t look stuffy. Warmth is one of the basic characteristics of a Boho living room decoration, and this layout adopts such look in a deeper way. The dark wooden flooring is matched with the soft green wall which creates such a gloomy yet cozy atmosphere. All the furniture and accessories are kept simple, except for the throw pillow with the colorful decorative cover to make the room look more cheerful. 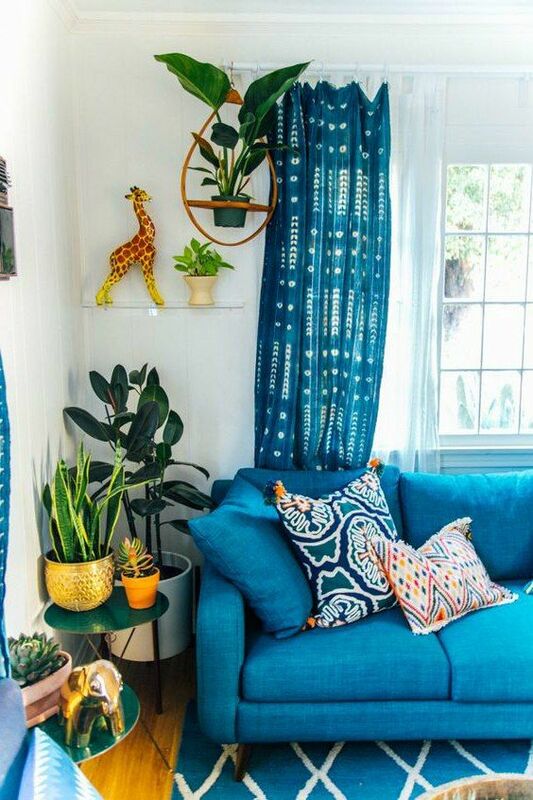 The simple way to make a unique Boho living room decoration is by adding a distinctive statement, and adding a fabric shade can be one of the easiest ways to do. 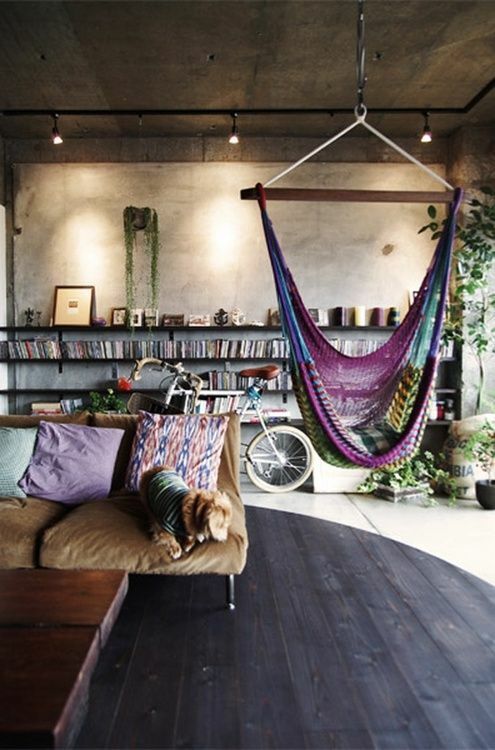 You can feel the cozy atmosphere of this living room by the shade installed above the sofa which is so tempting o try. As usual, the decorative rug, indoor plants, and vintage furniture become a nice complement for this mesmerizing living room. The traditional-inspired Boho living room decoration which leaves all the couches and chairs away. To provide the sitting area, a decorative rug is combined with lots of festive pillows which make the room look so stylish. Then, the rustic white wood flooring flows really well with those indoor plants to add an inviting natural nuance. A gorgeous Boho living room decoration with a very chic look that fits your taste of simplicity. The room doesn’t have lots of decor items but it’s enough to enjoy for everyone. The smart combination of the decorative rug, naturally vintage furniture, and indoor plants make the room look and feel so inviting. It gives an all-white room a superb stylish touch in a very simple way. 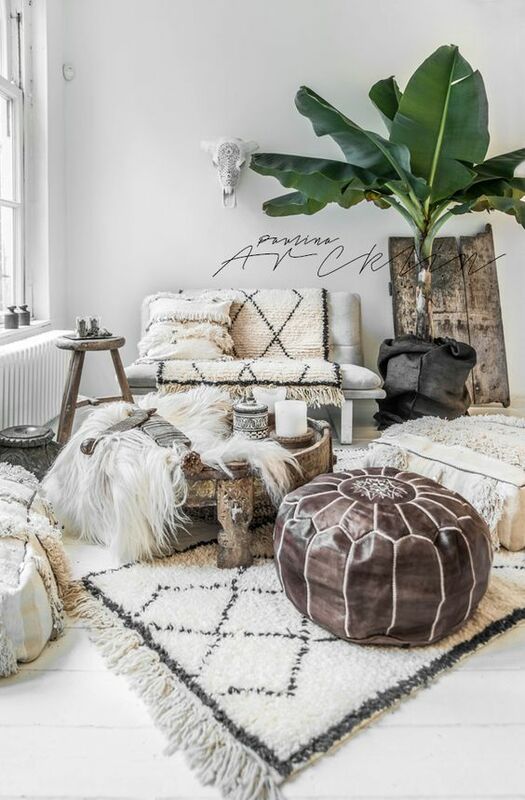 The mixture of white and rustic touch of this Boho living room decoration is so admirable. It creates a calming cozy atmosphere which makes it look so joyful. Moreover, the firepit adds a more comforting nuance that no one can resist copying. This Bohemian living room decoration shows an easy and simple way to create a distinctive layout which gives you a great comfort. The shade obviously becomes the central attention here which bring the style of the room to the whole new level. Furthermore, you can see the greeneries and wood log accent which enhances the beauty of the room and adds another style to its overall look. One of the most popular room’s layouts today is displaying the storages in a cluttered yet admirable way. Here, the open shelves work to handle some books which decorate one side of the room. 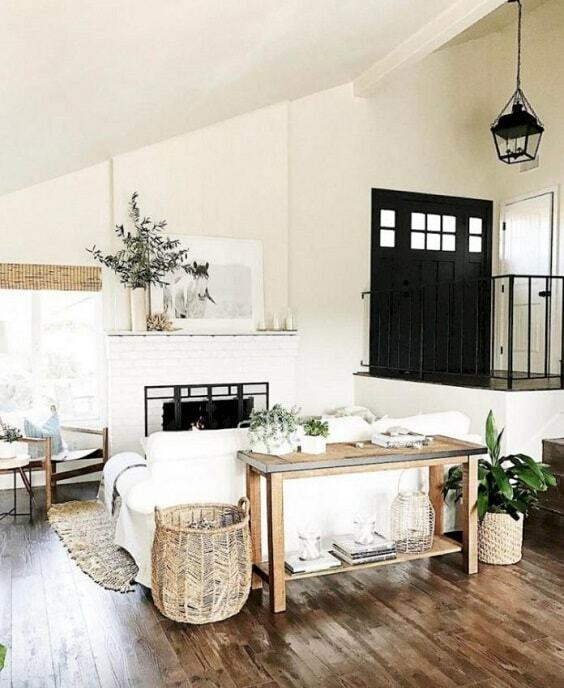 Then, the decorative rugs, earthy furniture, wooden beams, and lots of linens become the main factors which give the Bohemian touch to this living all-white living room. The festively stylish Boho living room decoration which is filled with lots of decorative accessories and decor items. Smartly, those elements create such a harmonious look which makes the room feel so pleasantly inviting. As you can see, all the colors of the room go side by side very well, colorizing an all-white layout distinctively. The wall arts are the easy decor items that you can always choose when you want to have a decorative Boho living room decoration. In this idea, the wall arts with wooden frame beautifully decorate the white wall. 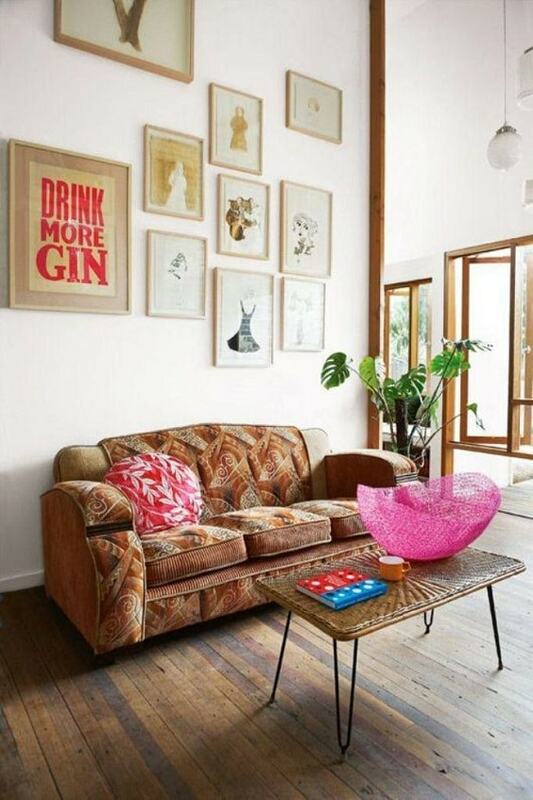 Then, the wooden flooring and brown sofa gives a superb earthy statement which makes it so inspiring to try. The decoration of this room exhilaratingly pops up a traditional vibe which you will surely love. It has such a traditionally inspired furniture and accessories in lots of vibrant colors which perfectly style up the room. To emphasize the Bohemian nuance, some indoor plants are placed in the corner of the room beautifully. 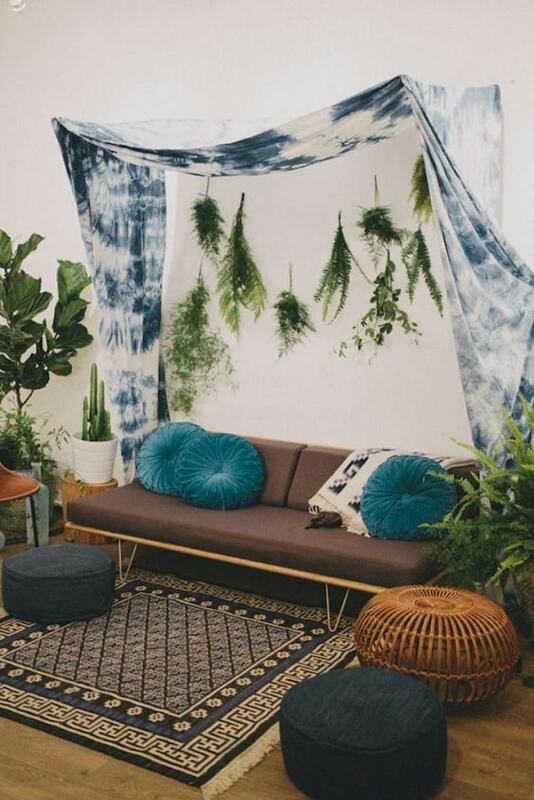 It seems like adding the shade to a room can be one of the best ways to create a stunning Boho living room decoration. Here, a huge canopy beautifully shades a spacious sofa bed which will remind you of those ancient layouts from the Greek castle. The sofa directly faces the wide rug with some decorative pillows and accent tables to provide a very comforting sitting area. Another Boho living room decoration in a rustic look with a lot of indoor plants which makes it beautiful and fresh at the same time. The combination of natural brown, green, and navy of the room creates a calming atmosphere which is so tempting to copy. Though the room may look quite stuffy, it’s still very inviting to enjoy due to its smart arrangement. 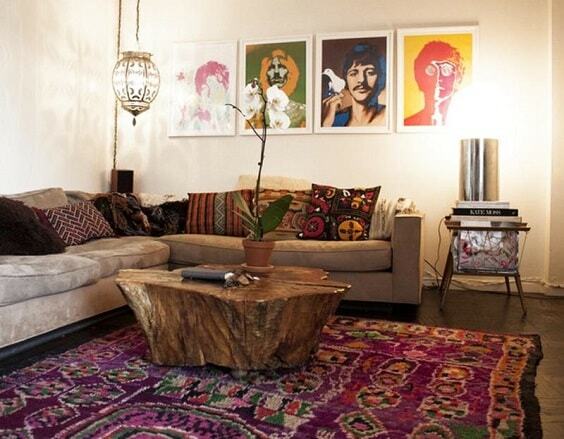 A gorgeously sleek Boho living room decoration in dazzling bright layout t include in your ultimate inspiration list. The room looks spaciously comfortable without too many furniture and accessories. The black steel standing lamp gives such a nice industrial touch to the room which becomes one of the focal points of the room. Since the Boho decoration always relates to something natural, you can play with this particular characteristic by adding some unique decor items. 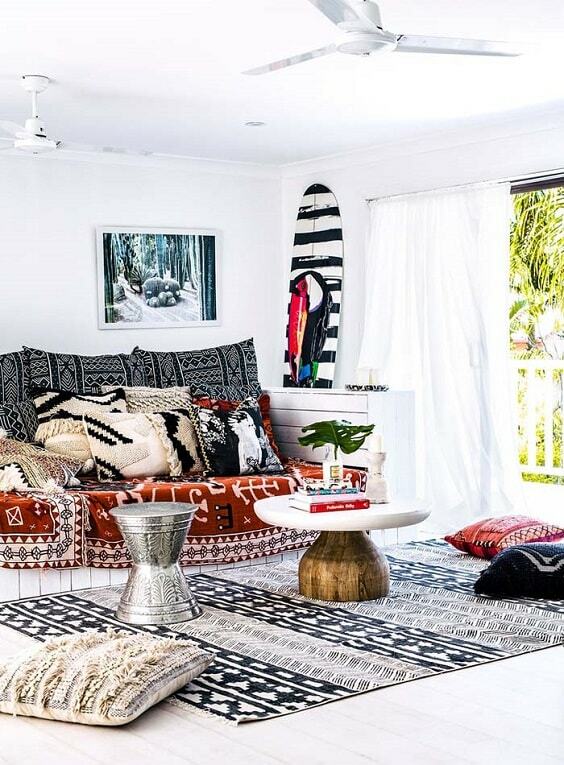 Here, the surf gives the room another style which makes a Boho living room decor looks more attractive. 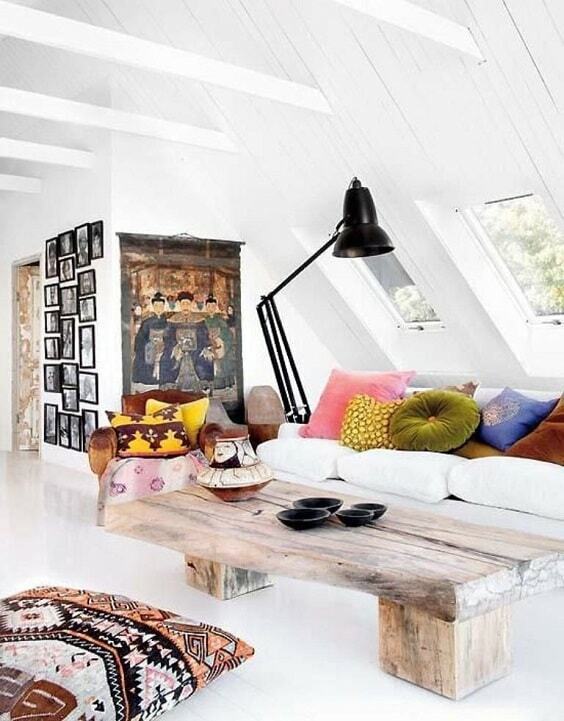 Yeap, combining the Bohemian and rustic look is always a great idea to create a stylish layout for your living room. 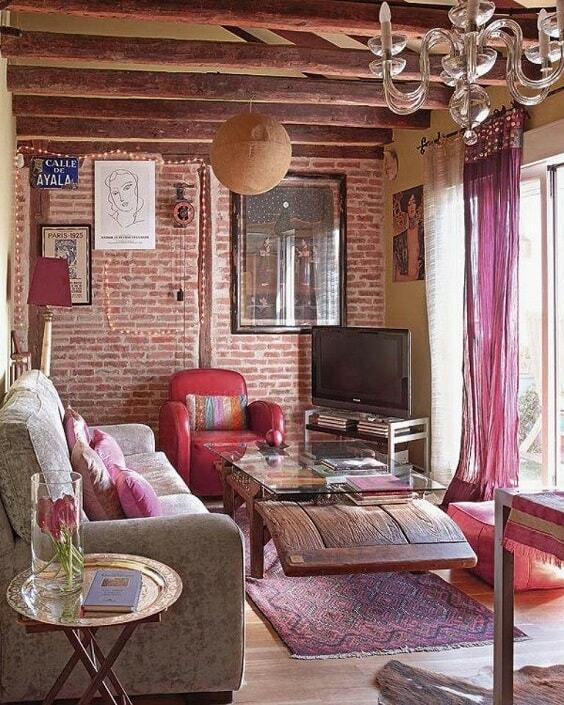 You can see the exposed brick wall and wood beams in this living room give a bold rustic statement awesomely. 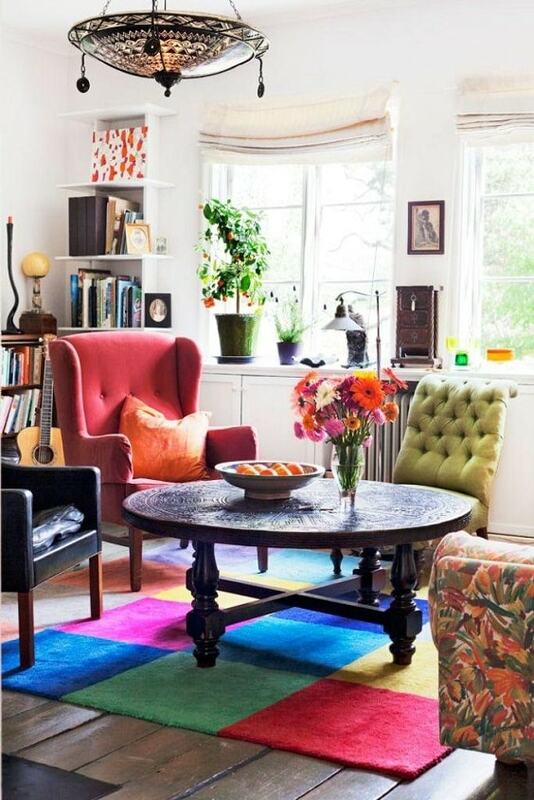 Then, the decorative rug and magenta fabric add a chic Boho touch to the room in a beautiful and simple way. The textured linen is actually a must-have addition that you have to consider when you are about to create an adorable and comfortable Boho living room decoration. This idea shows a simple layout with lots of textured linens cluttered around. The rustic couch and table are chosen to decorate the room, complete with a huge indoor plant. As decorative becomes the character of a Bohemian decoration, you can play with lots of the room’s element to create such look. Here, the flooring gives an all-white room another style beautifully. 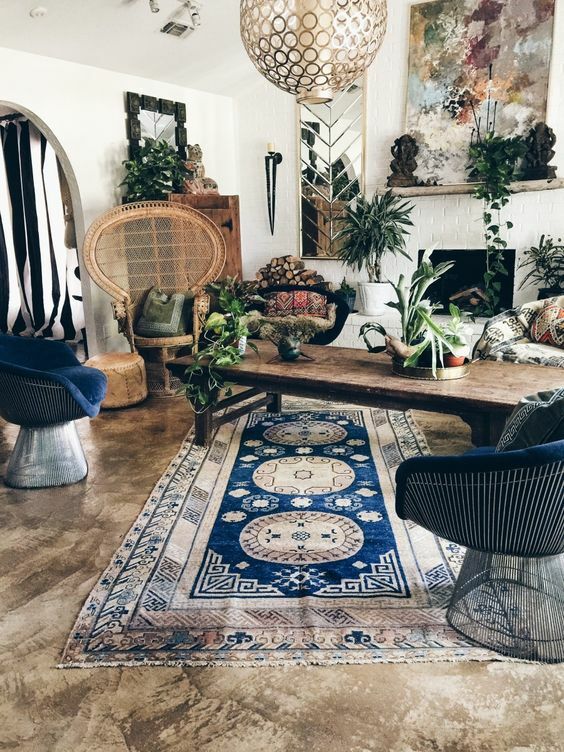 Then, the traditional Boho rug makes the room look simply Bohemian without too many accessories. 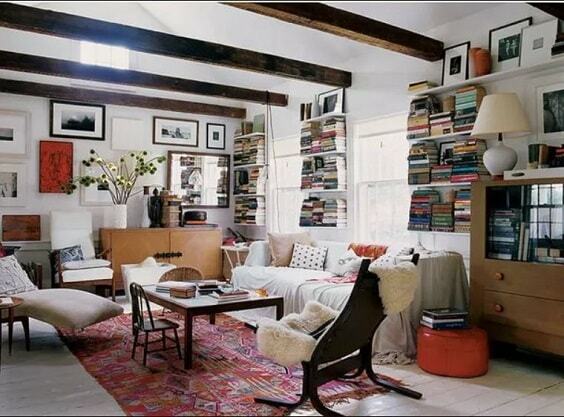 For you who have a spacious living room, this chic Bohemian layout can be one of the best options to style it up. 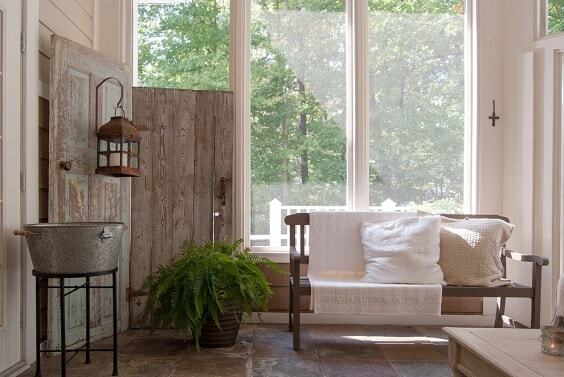 The room is all finished in white which is completed by rustic furniture, decorative accessories, and indoor plants. The arrangement of all the elements of the room creates such an irresistible comforting atmosphere in a very stylish way. 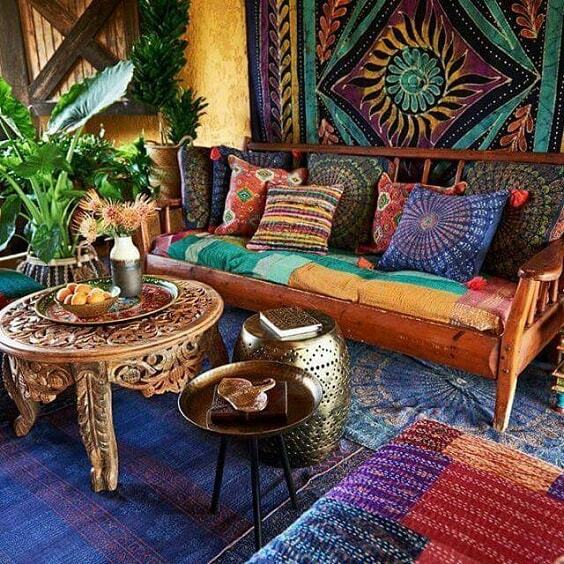 The unique Boho living room decoration with colorful nuance which fits for you who want to have a simply cheerful layout. 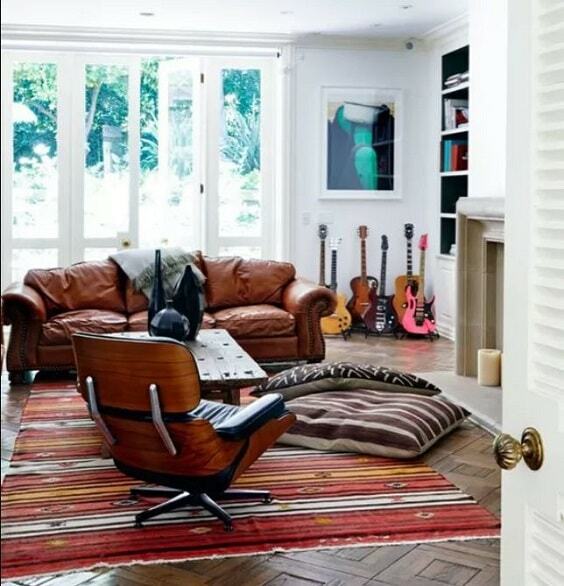 Obviously, a vibrantly solid colorful rug with the chequered pattern is the main focal point of the room which brings its style to a whole new level. Then, the mid-century furniture with indoor plant gives the room a Bohemian touch gorgeously. 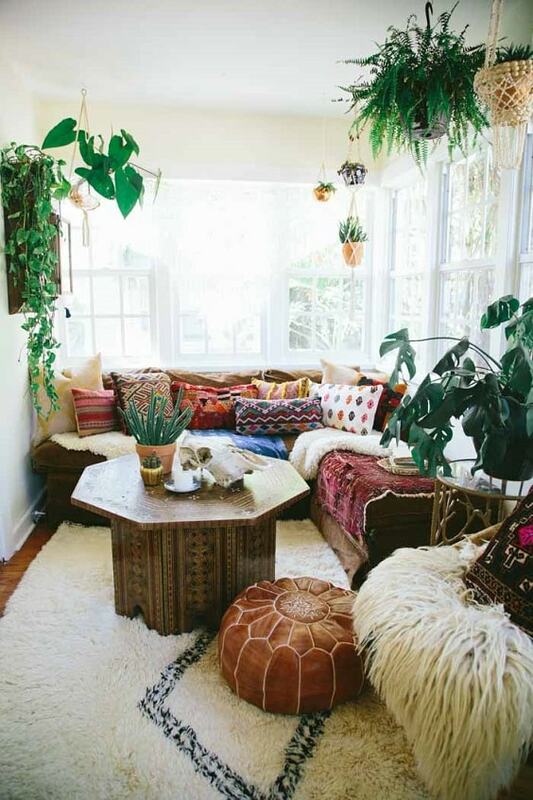 This Boho living room decoration combines all the basic character of a Bohemian look in a very stylish way. 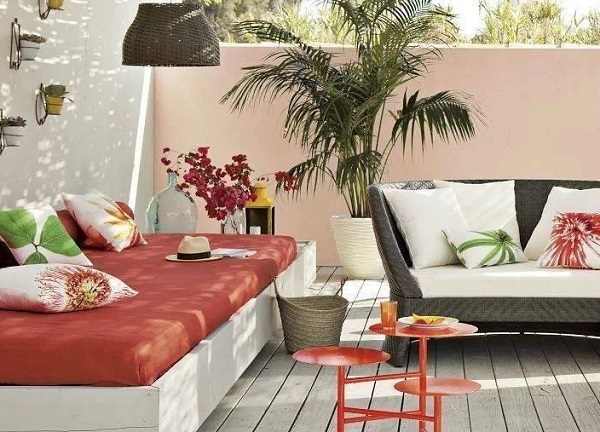 The colorful layout, textured linens, rustic furniture, wall arts, and indoor plants are arranged harmoniously, creating a very inviting look that everyone will love. 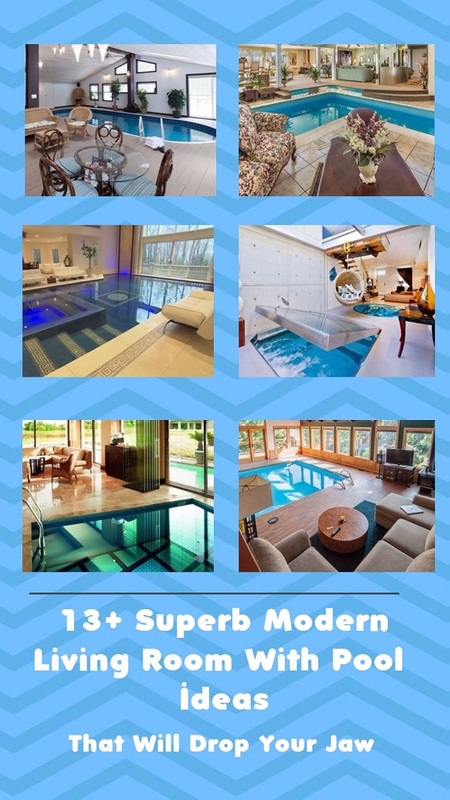 When we are talking about the latest color of the room which you can easily find in the home improvement magazine, teal will be the best answer. 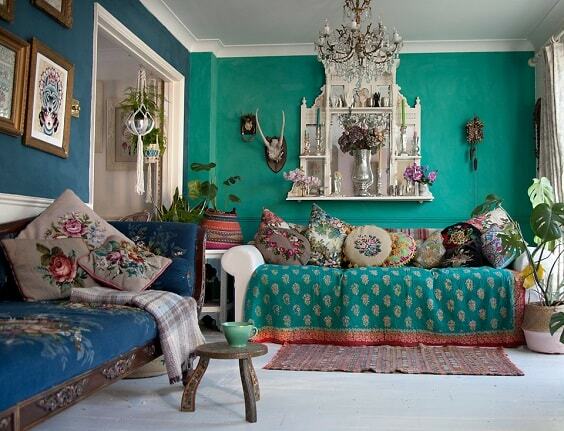 This Boho living room decoration applies the color beautifully and flows well with turquoise. You can see the furniture and accessories create a very harmonious look which makes the room become way more stylish. 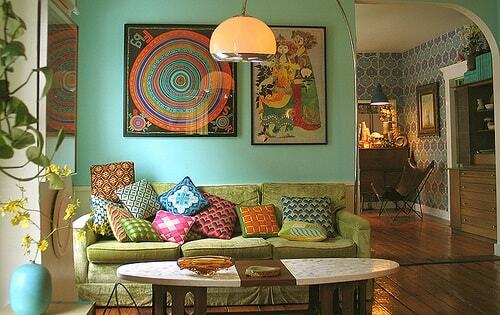 A colorful Boho living room decoration doesn’t always mean the one with lots of shades. Here, an all-white living room is colorized mainly by vibrant bright blue which is so enough to make the room look fashionably catchy. 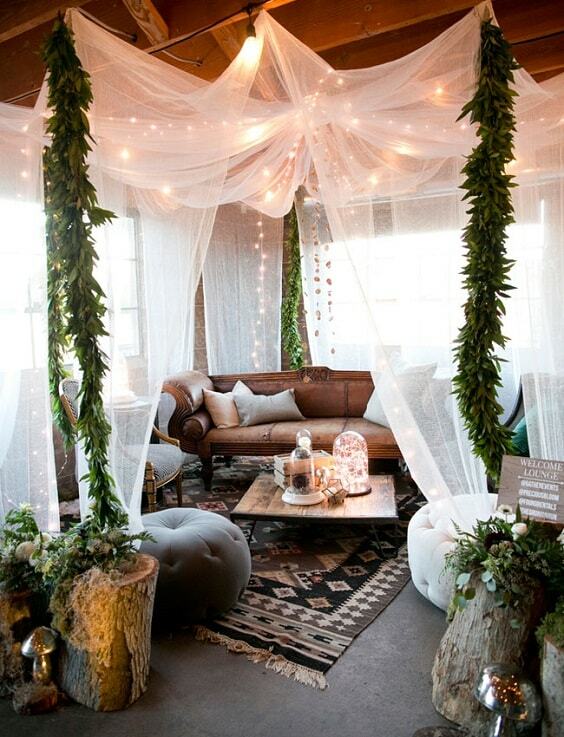 The indoor plants and decorative drapes emphasize the Boho touch around the room which you can try easily. Adding a golden stuff to a Boho living room decoration can be an easy way to make it look more luxurious. 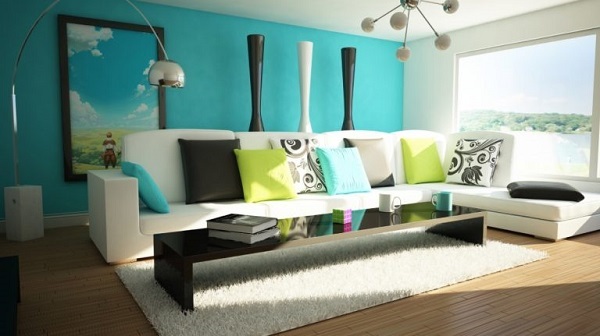 You can apply such idea to the accent table and wall decor just like this layout shows. 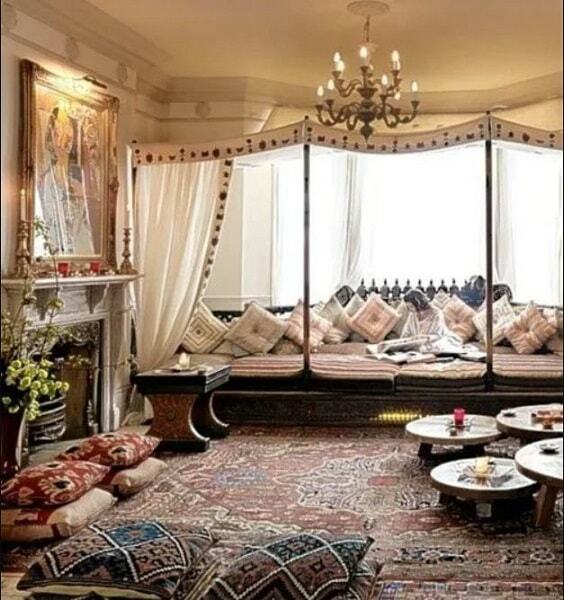 They are enough to make the room look ‘expensive’ and still keep the basic Boho characteristic. The striped stuff always works very well for a Bohemian living room decor since it gives a catchy decorative look easily. Here, the stripe fabric is one of the focal points which give a particular statement to the room. With the soft-colored throw pillows, the striped cushion covers look more standout to colorize the room beautifully. What’s more exhilarating than having a swing inside your living room? 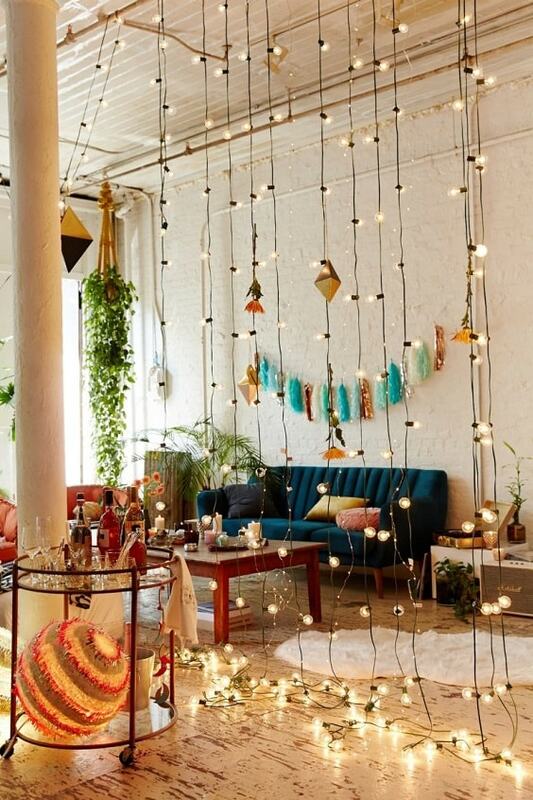 Well, this idea shows you how to add it beautifully in a gorgeous Bohemian living room decoration. The room adopts the rustic-industrial look in a gloomy color, which makes the purple decorative swing becomes the central attention of the room. The pop art is one of the trendiest decor items of the year which becomes every homeowner’s favorite to decorate their living room. 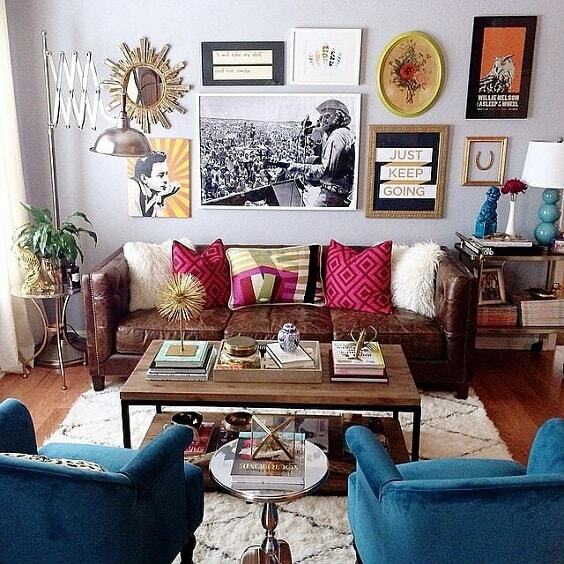 This Boho living room decoration shows a nice way to complete the layout with the pop art pieces. 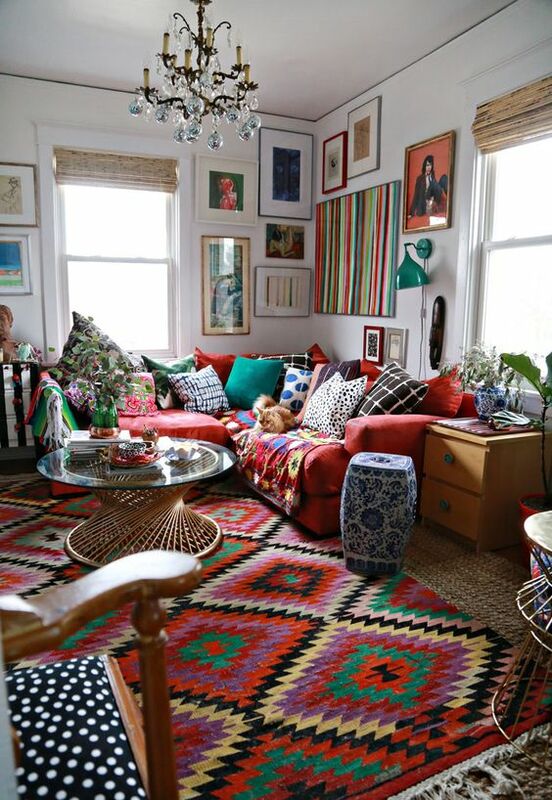 The colors of the rug and throw pillows match beautifully with the pop arts, creating a beautiful harmonious look. The unique Boho living room decoration which is totally worth to be your top choice. 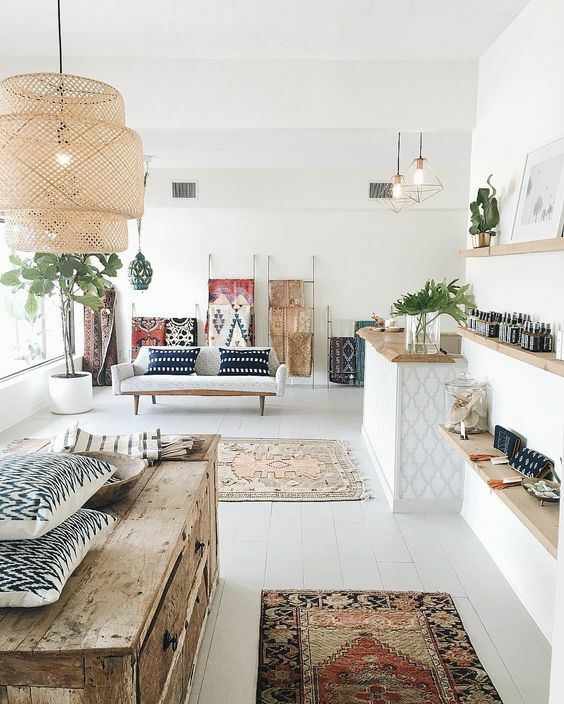 It’s basically an all-white room with the brick wall with some adorable furniture and accessories which pop up the Boho nuance. The, a string light completes the decor which resembles the look of a curtain, it surely makes the room becomes distinctively stylish. With lots decorative stuff, this room looks so attractive and absolutely tempting to copy. Its reddish look is then combined with wooden stuff which creates a warm cozy atmosphere. For sure, everyone will love to enjoy this kind of living room for hours and hours. The wallpaper can give a room a particular charm which you can always choose to complete your Boho living room decoration. Here, the teal wallpaper with earthy pattern decorates the room beautifully and matches well with the furniture. Then. lots of decorative linens and indoor plants give the room a chic stylish touch. Eventually, those are some amazing Boho living room decoration ideas on a budget which can be an ultimate reference when you are about to bring the style to your living room. 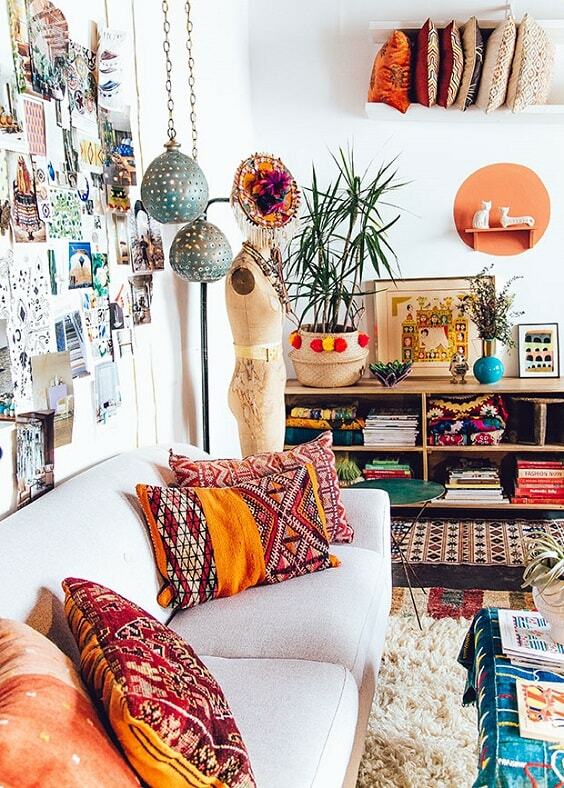 You don’t need to spend lots of money to make the room look as eclectic as possible with the Boho decor. In addition, we share you some short brief tips on how to make a cozy and stunning Boho living room decoration to help you to get the best one, as explained below. Wall Art – This thing is the decor item which gives a strong statement to a Boho living room. 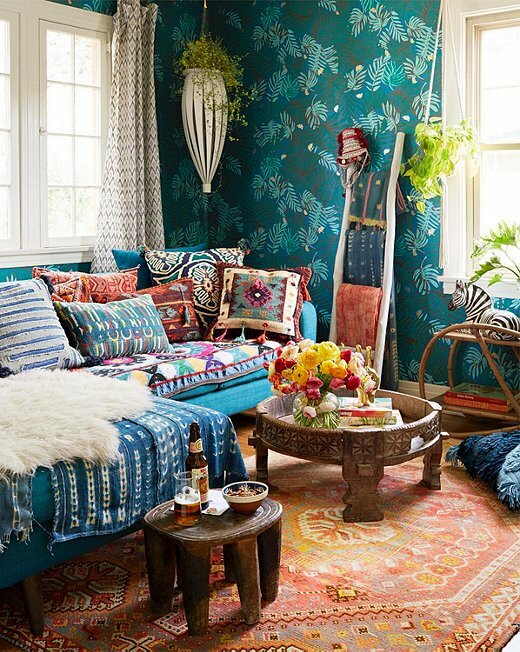 It’s like a must-have stuff to give an ultimate Bohemian look to the room. The weaving and macramé wall art are the ones which will give a beautiful Boho touch. Indoor Plants – Since the purpose of the Boho-themed decoration is also to bring extra earthy comfort to the room, the indoor plants are the next thing that you have to apply. The succulents and terrariums are the best choices to emphasize the Bohemian touch in your living room. Vintage Stuff – As has been told before that Boho decoration is actually invented long time ago, so it’s also an old yet timeless layout. 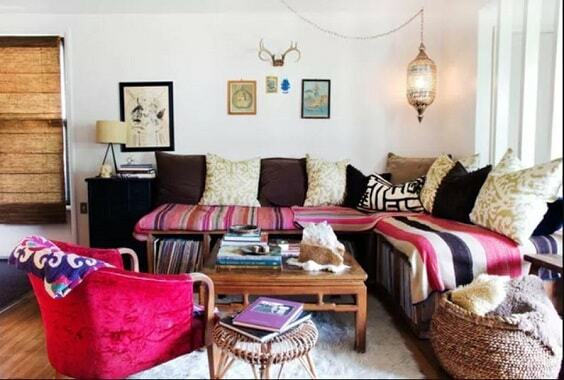 Filling the room with vintage stuff is definitely a great idea to create a very admirable Boho living room decoration. Decorative Accessories – The Boho decoration is always the great option for those who love the festively decorative layout. 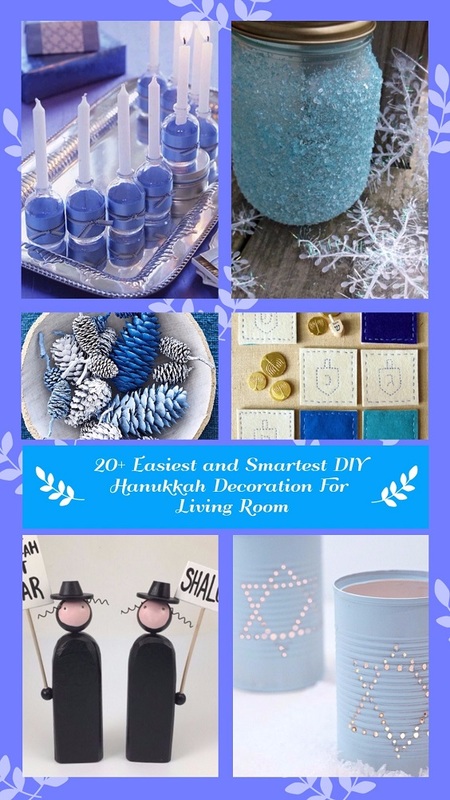 Mixing the pattern of the accessories can make the room look as festive as possible beautifully. For instance, you can mix a chevron rug with a Mediterranean tablecloth. Earthy Furniture – The furniture with a natural wood finish will strengthen the natural nuance around the room with the Bohemian layout. 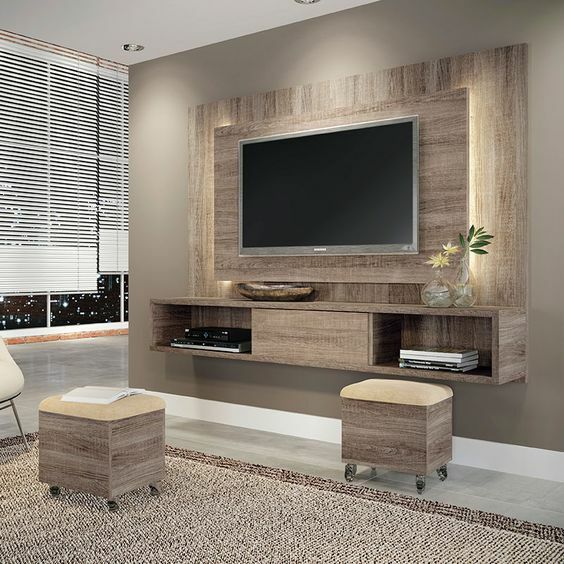 You can try to choose a TV console in wooden finish and sectionals with a leather look. Textured Linens – Not only for the comforting purpose, the textures linens also give the room a particular look which strongly relates to the Boho characteristic. 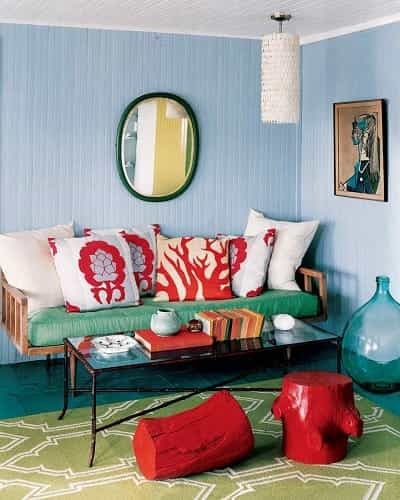 You can apply the look to the rug, pillow and table cover, or just place an extra additional fabric as the decor item.